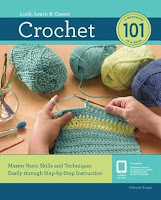 The most comprehensive beginner’s book available, Crochet 101 begins with an introductory section covering all the basics of crochet: selecting yarn, hook types and sizes, other tools and accessories, crochet gauge, chaining, forming the basic stitches, and reading patterns. I have been considering having a go at crocheting for a while, so when I saw this book on NetGalley, I couldn't resist requesting it, in order to learn more and finally make up my mind. Certainly, based on what I've read here, I am keen to try and will look for some beginner's hooks the next time I go into town. (I also plan to add this book to my wishlist at TBD.) Crochet 101 is set out perfectly for the beginner. It starts with general information on hooks and yarn, before moving on to simple stitches. With each new stitch or technique there is a project or two to try, which allows you to create tangible items that demonstrate your progress. Many of the projects (which range from household items to clothing) hold appeal; they are something you would want to create and use/wear. At each stage there are clear instructions, accompanied by useful photo illustrations. There is also a link to view video tutorials, which further demonstrate techniques. Overall, Crochet 101 is an excellent resource both for those looking to take up crochet for the first time and for existing practitioners looking for new projects and ideas.